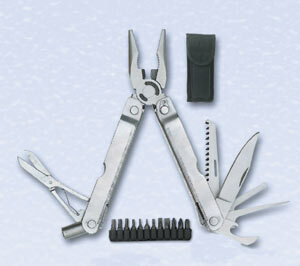 CLOSE OUT $14.00 LIMITED QUANTITIES GS-209, Large SS tool with bits and sheath. Stainless handles, 4-1/2" with 15 functions Imported. Box Size: 10" X 2-3/4" X 1-3/4"